Very few woodworkers know the potential of this very available tool. The router does so much more that make grooves & mould edges & terrify uniformed users. 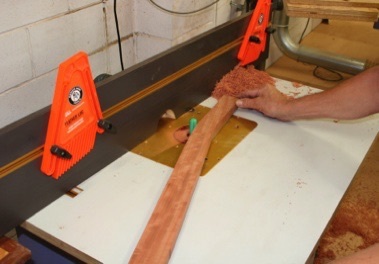 Most woodworkers have a sense of what a remarkably versatile woodworking tool the router is, but many wonder how they can learn how to make full and confident use of it. It is capable of so much more than just making grooves for shelves, and moulding table edges. I have been a professional woodworker designing and making to commission for about 30 years and there haven’t been many pieces I’ve made without using the router. About 25 years ago constant demand started me running my one day workshops. Enthusiastic feedback and ongoing demand means they are still happening. There is obviously a lot to fit in so the format is show-and-tell rather than hands-on. I promise you’ll get your money’s worth. Router workshops are run on a Saturday from 10am till 4pm. - whenever the waiting list demands and my commitments allow. The cost is $175, which includes GST, an excellent lunch and afternoon tea.